January 21, 2019 Document Management News, News. A document management system is used to track, manage and store documents while also reducing paper in the office. Document management integrates with a business’s CRM system and will be part of an effort by the management to improve workflows and processes within the business. One department that can show significant improvements by implementing document management is the accounts department. The accounts payable section will welcome any new process that speeds up payment of invoices and by automating certain elements this can cut payment times significantly. Job cards, delivery dockets and relevant paperwork will have been scanned and the detail uploaded to the management system. This helps with keeping all the information to hand to ensure correct invoicing and back up material for passing invoices. If any query comes in by phone, the accounts team will have all the relevant information at a click of a mouse to settle any misunderstanding. This is an ideal service for a variety of industry sectors. Any business that has a high number of transactions or is heavy with paperwork relating to projects will find benefit. Construction companies, garages, leasing companies would all benefit from document management services. 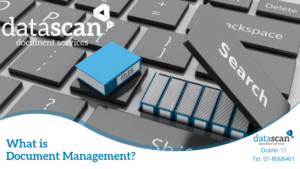 A practical example of document management in practice is where it is used by a facility management company to manage their work. There will be various job sheets to be filled in by workers that are operating remotely. There will be separate invoices to clients and suppliers and there will be various reports and supporting information. All this paperwork can be scanned and uploaded to a system for a full view. Having visibility of time spent on the job will enable the accounts department to accurately bill the client. Having the full detail of the work completed as a support will make any query easier to answer. Thereby ensuring prompt payment by the client and improving cash flow for the company. For any business, having information stored digitally will result in a full record of customer activity. This will be easy for your team to access for audit, analysis or even as a sales tool. Document management will also help with storage of information, as much information as you like stored securely in the cloud. If you think document management might be the solution for your business, why not avail of a free trial today.